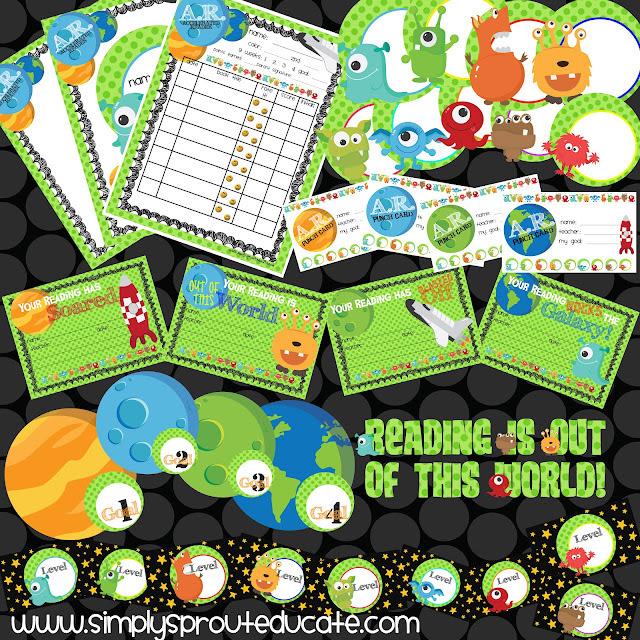 We are so excited to show you are "Accelerated Reader Reading is out of this World Kit" This kit is designed to motivate and challenge readers to reach their goals. Our featured classroom comes from Mrs. Amy Selfe at Gilchrist Elementary School in Tallahassee, Florida. She teaches First Grade and is loving using the kit to challenge her students to reach their semester goals. Books are easily kept organized in leveled baskets using the cute labels that come with this kit. Just attach your colored sticker to the label and to your books and place baskets on a shelf for east student access. Using bright colored stickers that match the school library's Accelerated Reader levels helps students to read books in the classroom throughout the day in order to help reach their goals. This colorful display board ties in beautifully with the theme. It allows students to express their individual creativity by coloring and decorating their rocket ships. You can add pictures or just their name. Attach strips of red, orange and yellow tissue paper as streamers. 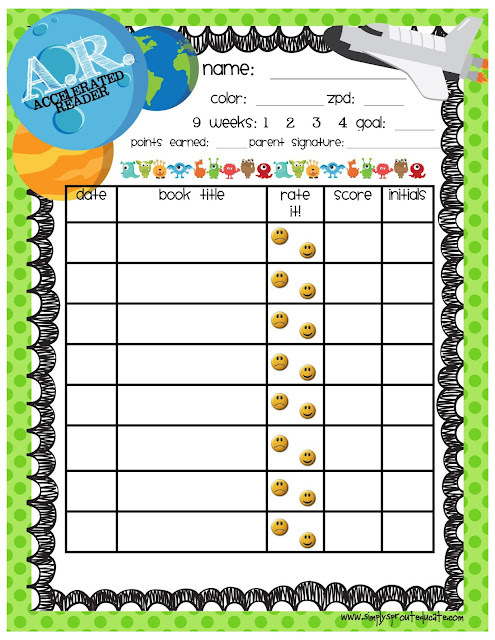 The Reading Log provided in the kit is the perfect addition to a daily student notebook allowing parents to keep track of nightly reading. Blank pages provided allow you to create your own personal letters to update parents about goals, incentives or other important messages about your reading program. The colorful planets can be printed and used for your bulletin board. Students individual martians can be placed on or around the planet as they make their goals. One way to do this if you are short on space is to put each individual martian on a clothespin. Attach ribbon to the back of each of the goal planets. As students make their goals their clothespin can attach onto the ribbon of the different planets. This would be a great way for the students to actually move their martian when they make their individual goals. We hope you like our kit as much as we enjoyed creating it! There are more resources included that aren't mentioned her like student awards and weekly goal punch cards. We hope hat you will swing by our store and check it out. We are offering school wide licensing for use of this product. Just purchase the school wide site license and every teacher at your school can use and copy the product for their classroom. What a great way to incorporate a school wide reading theme! Get your free reading log above for your students! Click on the link below to purchase the entire kit! Love it! So bright and cheery and just what I need to motivate my more reluctant readers/quiz takers!